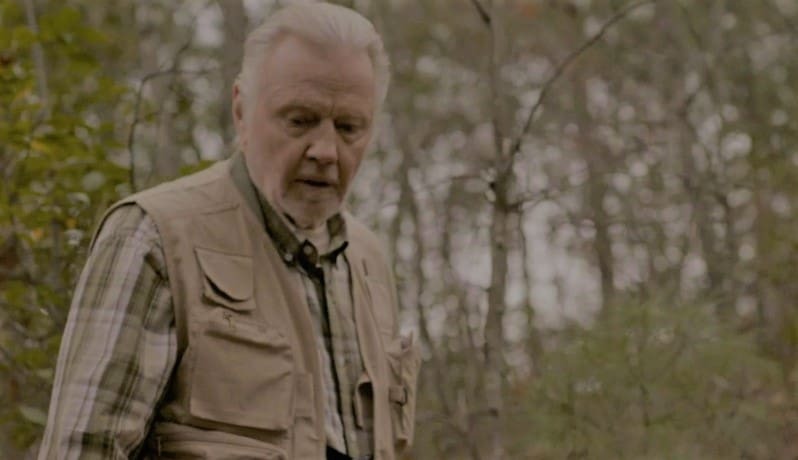 It’s been a brilliant ride for one of Hollywood’s greatest living actors, Academy Award Winner Jon Voight (“Varsity Blues”, “Mission Impossible”, “National Treasure”) and his latest offering in “Surviving The Wild” is but an addition to that library. A film for all that touches on many familial matters, thirteen-year-old Shaun (Aidan Cullen) sets out on a journey to find a way to spread the ashes of his beloved Grandpa Gus (Jon Voight) on a remote mountaintop, all the while being led by his spirit, leaving his embattled parents to worry about his well-being in the wilderness. With his exceptional way of transforming his performances to a higher degree than most actors over the decades past, Jon Voight has been well-known for his everlasting appeal in the world of film. Delighted to spend some time speaking with him, I thought I’d ask him about his latest movie project and uncover a long-running Seinfeld mystery along the way. Jon Voight: I was moved by the script. It was the first draft when I read it and it touched me. I saw the role of Gus the grandfather and I thought that he reminded me a little bit of my dad who was a very charming guy. My father was a golf professional who was essentially a teacher who taught life and always taught it with humor. I saw this character as a way to share a bit of my dad with people. DC: What was the process of getting into the role of Grandpa Gus like? between us. The best kind of acting is when you are really listening, really being able to affect the other actor and vice versa. I’ve had a great fortune for many like that. Parts of my performance are always connected to the quality of the actor that I deal with. With Dustin Hoffman or the other actors in Deliverance and even Jane Fonda; we all had a relationship that was strong. I worked with very great talents who also were at risk in the scenes with me and they made me better. Working with this boy, Aidan Cullen, made it a very strong relationship. He’s lively and responsive. He has a really sophisticated understanding of that. It’s unusual in that he fell in love with improvisation. We got along while doing the work and became those characters to each other. I was so impressed with his performance. DC: You had some funny and poignant lines in “Surviving The Wild”. In films in which you star, do you ever improvise your lines? JV: I always play with the material. Always. I open it up a little bit. I’m not too shy about saying “Maybe we should do this or maybe we should get into this” which can be spontaneous. This boy also had that ability and had been working in that way. It’s like pitching to somebody and if your catcher is inexperienced, you’ll have to be extra careful. However, I could give him anything and he would respond. DC: You mentioned that the discovery of Aidan Cullen reminded you of the discovery of Dakota Fanning. has the same kind of talent. DC: For the years ahead, have you made any new goals for acting? JV: Every time I go to work I start with a clean slate and I put things together little by little. It’s always unique. I take a challenge and try to do it without knowing how I will come through with it. Just seeing how it flies. DC: When you are not on set acting do you have any hobbies you enjoy? JV: I have my grandchildren and enjoy my relationship with them. And my brother’s children and grandchildren. When I am on the set I meet new people and get involved in new adventures. For example, the dog in this story, Rylie, was such a loving dog, had so much soul. I got to spend time with this dog as well and we saw how alive this dog was as he added so much to it. We all fell in love with him. DC: Considering your deep history in Hollywood, does it feel a bit unfair how the media portrays you simply because of your political beliefs? JV: This country is built on free speech and free exchange of ideas and we dare not lose that. So, I am very happy to express ideas when I wish to. I don’t get embroiled in politics when I am working, I don’t proselytize. I stay away from that unless someone comes up to me and asks me a question, then I will converse. It’s an interesting atmosphere these days because when I was growing up we had the actors that served in World War II and they were all patriotic. And now there seems to be, since the 1960s, a negative view that has come into being. It’s very unfortunate. I’m very grateful for having been born in this country and the opportunities it affords me. JV: (Laughs) You know what’s funny about that? My mother owned a Chrysler LeBaron. She lived in Florida at the time and she said “Jon, if you are going to do that show, you get them to buy the car from me” which I didn’t have the guts to ask them, but they probably would have done it! They built the script out of an experience that the writer had where he bought a car because it was sold to him as Jon Voight’s car that had a pencil in it, which turned out to be a doctor named Jon Voight and it wasn’t me. It was all part of the script. When I came to the set, the writer said, “Jon, could you do me a favor and walk around the corner with me, I want to show you something.” We walked around the corner at Warner Brother’s backlot and he showed me a Lebaron and he said, “did you ever own this car?” and I said “No, I never did” and he was let down. So, the whole thing was that they had this experience of being sold this car which they thought was mine. It was very charming; the whole experience gave us this memorable episode of Seinfeld. “Surviving The Wild” is available for download/purchase now.